In a hard-hitting evaluation of the PRECIFAC recommendations, MP S. M. Marikkar yesterday criticised policymakers for failing to formulate a legal framework to penalise corrupt politicians, insisting that there is a necessity to revolutionise the prevailing political culture to clean up Sri Lanka’s future. “The current Parliament has a great responsibility to formulate and pass new regulations to punish the corrupt politicians in the system. We need to put an end to fraudulent people entering the political arena of this country,” he said at a special press briefing held at the UNP Headquarters yesterday. Insisting that three years have passed without punishing politicians with allegations against them, Marikkar said it was the one expectation the general public had from this Government, which he said it has failed to deliver. “Sri Lanka has always been a developing nation from our grandparents’ generation, but now it is high time we change this country by inculcating a good political culture to elevate it to an advanced economy at least for our children,” he said. Pointing out that no one can dissolve the Parliament till 17 February 2020, Marikkar said there is sufficient time to bring in new laws to punish the wrongdoers. He claimed judicial and political systems have failed to address the issues behind corrupt politicians, calling it was high time to punish those found on the wrong side of the law regardless of their positions or social standing. Marikkar went on to say that, according to the 34 recommendations of the Presidential Commission of Inquiry (PCoI) to investigate and inquire into Serious Acts of Fraud, Corruption and Abuse of Power, State Resources and Privileges (PRECIFAC), Former President Mahinda Rajapaksa, Basil Rajapaksa, MP Wimal Weerawansa, Priyankara Jayaratne, Jayantha Samaraweera, Piyasiri Wijenayake, Mohamed Muzammil, Renuka Perera, Danasiri Amaratunga, Janaka Ranawaka and Rohitha Bogollagama were some of the accused politicians in the report, who are still without charge. “If you are against corruption and a deceitful political culture, remove these unsuitable candidates contesting for the upcoming local government elections and lead by example. If they harp about anti-corruption culture at political rallies, then we have to wonder if they are talking with their rear-ends,” he quipped. Marikkar charged that the party leaders who nominated corrupt candidates should be held responsible. When asked about UNP MP Ravi Karunanayake who was accused in the PCoI Bond Commission’s report, he said that the party has decided not to let Karunanayake get involved in any work until the guilty becomes innocent. 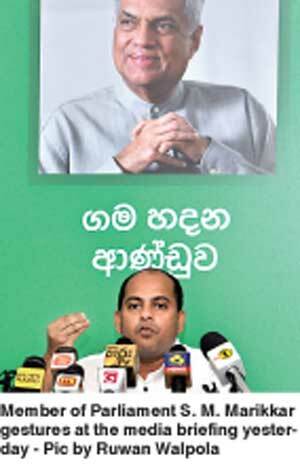 “The committee appointed by the Prime Minister has recommended UNP MP Ravi Karunanayake should not exercise any duties in his capacity as Assistant Leader until the investigation on bond irregularities by the authorities is over. We have given examples. We don’t care for the social standing of people; what is important to us is our party. We can replace people, but we cannot replace the party,” he said. Noting that the UNP is the single biggest political party in the country that represents all ethnicities and areas of the country, Marikkar said the party was nobody’s property to claim. “Late President R. Premadasa led by example, from his humble beginnings in the party until he became the President of this country. We only want people who are passionate about the party,” he added.